The owner, Sue, is fantastic! She has tailored tips and advice for every type of traveller and made my boyfriend and I feel very comfortable. Room and terrace were also beautiful. Great location and very comfortable place to stay. Sue was really helpful pointing out some places to visit and giving us a map. Thank you! Wonderful riad, central in the medina but still quiet at night. The staff here are exceptional - friendly and helpful, nothing is too much hassle. The riad itself is spotlessly clean, has a lovely atmosphere and exudes charm and comfort. Wonderful roof terrace. Highly recommend! Everything was more than great!!! We loved staying here! 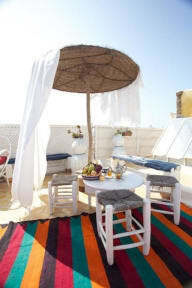 Awesome riad in a great location! Gorgeous views and right along the main drag. Breakfast was scrumptious and the rooms beautiful. We didn't have hot water but that may have just been because we couldn't figure out how to work it! Towels, soap, even robes were all provided! The rooms were quite spacious as well! Very welcoming and helpful staff! Nice place if you want to be in the Medina, a tat far from the surfing area. Sue made a mistake and double booked the room but then told me everything would be fine, so when we arrived we were unpleasantly suprised with the fact that we had to go to a different riad that she sorted out, which was extremely annoying. Riad Lunetoile looks nice and we were quite sorry we couldn't stay there but she booked us for Riad Inna which ended up being fantastic and made our stay in Essaouira great. Leider ist es überhaupt nicht unseren Erwartungen gerecht geworden. Das Preis-Leistungs Verhältnis stimmt überhaupt nicht.. es ist zum Teil sehr alt und nix besonderes.